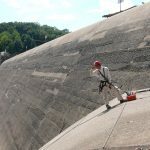 Vertical Access was contracted to assist Olson Engineering with nondestructive evaluation at the Occoquan Dam. 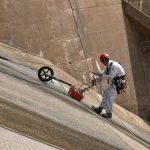 An investigation of the dam’s north abutment (side spillway) was performed using industrial rope access. 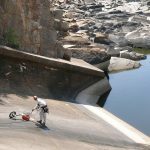 Specialized footwear was worn to navigate safely on the slippery sloped concrete surface while guiding ground penetrating radar (GPR) methodically along a grid on the structure to generate a map of the rebar size and spacing in this portion of the dam. VA also assisted with the gathering of topographic survey data to be used to create a 3D model of the structure. 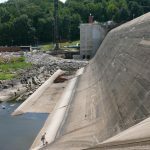 The Occoquan Reservoir is a 2,100-acre reservoir in northeast Virginia formed by the Occoquan Dam on the Occoquan River. 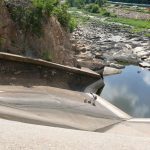 Managed by the Fairfax County Water Authority, it provides an important water supply to surrounding settlements in northern Virginia, with an output of 17 million US gallons a day to 1.2 million people. 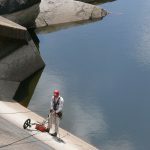 Guided a ground penetrating radar (GPR) antenna along the surface of the spillway on a 2.5’ grid so that GPR data could be recorded. 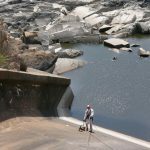 Worked with the Water Authority surveyor to record GPR path locations on the irregular dam spillway surface.